Hello and welcome to life at my little red suitcase! If you have arrived here following my leap from woolgenie thankyou for coming too. So after a huge deep breath, crossed fingers and toes, here I am. Writing life at my little red suitcase. 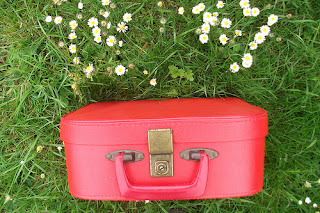 Well everything was going along fine, making, posting and then the Jubilee..... And then one day whilst out thrifting I came across this very sweet vintage red suitcase. It struck a cord. It stayed in my mind. I went back for it the next day, very happy to see it was still there waiting for me. I brought it home and admired it and it sat there, in the middle of everything. I knew I had a suitcase like this when I was a little girl. and ok yes slightly bossy! and this girl had a little red suitcase. I had found myself feeling suddenly limited. Woolgenie has lived close to my heart for a year or two now.... I realised that I wanted to make this change. I needed to make it now, before it became too difficult to let go. This little red suitcase had quite suddenly arrived back in my life and it felt like it contained all possibilities. I realised that instead of planning to leave, it had arrived! How sweet, and girlish, and bold! I have a little red suitcase, too, from my grandfather, with my name on it:) Thank you for giving it remembered significance! 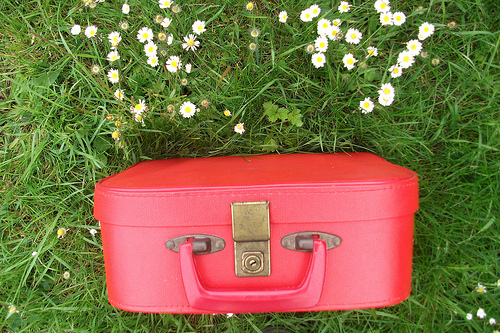 And I have a little red suitcase too, I think they are just what a girl needs and all the adventures that they suggest. That's a lovely story, and glad you made the big step. A new life, a new beginning for us to enjoy too. I also have a little suitcase, only mine is cream - way back from the 1960's. So many memories of the trips and the era in general. It's in the linen cupboard with spare blanket in it... I should get it out and and put my crafty things in it and keep it closed to me somewhere in the room. Maybe my little cream suitcase will inspire me too. Hi Heather. My name is Cameron and I had a question about your blog! I was wondering if you'd be willing to answer it for me. Thanks so much! :-) Hope you have a great rest of your day.